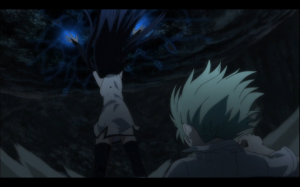 Brynhildr in the Darkness is an anime that is pantomiming a depth I'm not sure it possesses yet. The plot is thickening, and I'm enjoying some aspects while being leery about others. They mystery behind the witches' creation is what I'm most anxious to see. How did all the girls become witches? How is the lab still in operation? These are questions I'm interested in the show addressing.